Not a lot of colour out there today so I am testing out the psychological properties of yellow. Well known for its ability to make you feel happy, hopeful and optimistic, it’s also a colour with plenty of energy (advancing colour) and studies have shown it can improve communication and creativity levels when used in interiors. 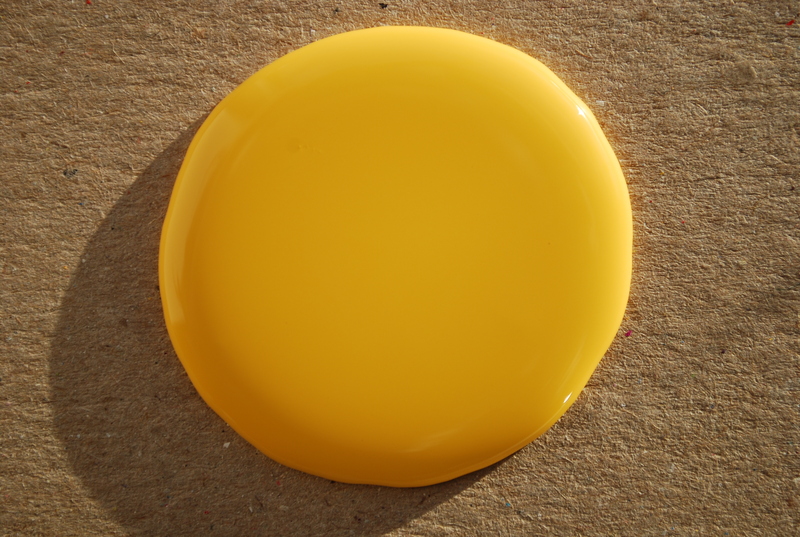 This yellow paint blob certainly radiates optimism and would certainly perk up a dull room! Slicing off the top of my warm soft boiled egg this morning and watching the yellow yolk spill out filled me with happiness! Just to complete the experiment I am listening to Big Yellow Taxi by Joni Mitchell , brilliant, ready for the day now! This entry was posted in colour and tagged creative, happiness, hope, optimism, yellow. Bookmark the permalink. I have a yellow handbag (purse if you are American) and I save it for days when I am feeling gloomy. It never fails to cheer me up at least a little bit.